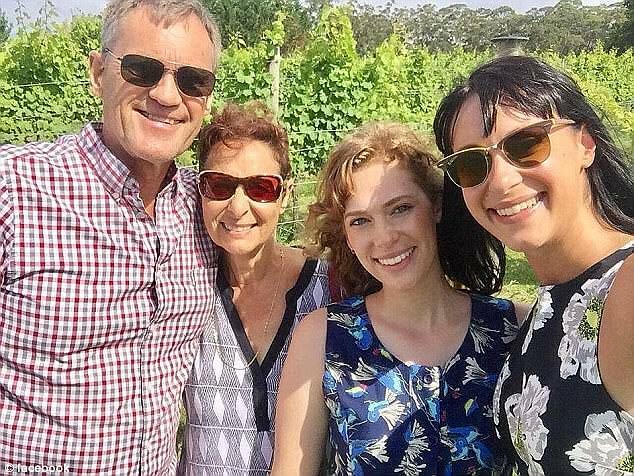 Home and Away actress Jessica Falkholt is still clinging to life two weeks after a horrific car crash that killed her parents and sister. Jessica, 28, and her sister Annabelle, 21, were pulled from the wreckage after their car collided with a 4WD near Ulladulla, on the NSW south coast, on Boxing Day. Parents Lars and Vivian died at the scene while Annabelle was flown to Liverpool Hospital in a critical condition, where she died as a result of her injuries on December 29. Jessica remains in a critical condition at St George Hospital two weeks after the crash, a hospital spokeswoman told Daily Mail Australia on Tuesday. As Jessica remains in hospital, relatives and friends of the Falkholt family prepare to farewell Annabelle and her parents Lars and Vivian at a service on Wednesday. A funeral service will be held at St Mary's Catholic Church in Concord in Sydney's inner-west. Jessica's relatives revealed the left side of her brain was damaged, which meant her personality and memory could be affected. Her relatives admitted they were grappling with how to explain she was the sole survivor of the horror smash. Jessica (far right) with now deceased sister Annabelle (second right) and her parents Lars (far left) and Vivian (second left). James Randazzo, Jessica's second cousin's husband, said they were still waiting for her to wake up. '(Jessica) may wake up and, if she does wake up, is she going to be a different person?' he told News Corp Australia on Sunday. Doctors reportedly told the family it could be weeks or even months before doctors - who removed part of Jessica's skull and kidney - knew how severe the damage to her brain was.